Anything but ordinary, this unique quilt features triangle appliqued panels alternating with scrappy strip-pieced inverted triangles. Welcome spring into your home with the fun motifs and saturated colors on this sampler quilt. 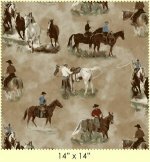 This 100% wool applique on woven cotton finishes 52''x59'' and is only a 10 month block of the month program at $23.99 each month. Mark Your Calendars for Quiltapalooza! 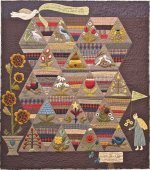 The gang just returned from Fall Quilt Market in Houston with some great items. Don't miss out on seeing the newbies and getting first dibs to purchase and take these items home. Mark your calendars and make your reservations for Sunday, Nov. 23, from 2-5 p.m. We are limiting the number of spots at Quiltapalooza to ensure everyone is able to experience and enjoy the new products. Guests will pay $10 in advance to secure their reservation and receive a $10 discount on top of any additional Quiltapalooza discounts on purchases made that day. Once we meet the seat limit, we will open an additional session for sign ups. Register today. We will be closing at 4 p.m. on Friday, Oct. 31, to participate in Historic Downtown McKinney's Halloween trick-or-treating. All the trick-or-treaters converge on the square to score a huge bounty of candy in McKinney's annual Square On The Square. We will resume normal business hours on Saturday, Nov. 1. We have some "PFabulous PFun" in the works. Monday, Nov. 3, kicks off our month of "PFun"! Look for a "PFabulous PFun" Happy Gram for more details about this month long event on Monday. It's so exciting, we can hardly stand it! This is a great way to give paper piecing a try. With just scraps of fabrics, you can create this small version of a traditional quilt. You may think tiny means tricky, but don't be fooled! With paper piecing, you can piece like a pro! Join Pam Weege on Wednesday, Nov. 5, from 10 a.m. - 1 p.m. to create this fun framed piece. Register today. A reminder for you Tips & Techniques members! Your Thursday Tips and Techniques meets Thursday, Nov. 6, from 6 p.m. - 8 p.m. and for Monday members, Monday, Nov. 10, from 12 p.m. - 2 p.m. Don't be late, you don't want to miss any tips! Get your creative juices flowing! 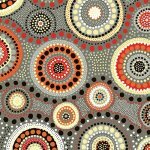 In this two part class on Friday, Nov. 7 and 14, from 10 a.m. - 1 p.m., you will learn many embroidery stitches as well as techniques for beading and couching. 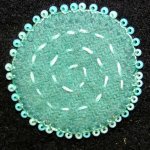 Jill will teach you how to take your wool (and cotton) projects to the next level by incorporating these embellishment stitches and techniques in your projects. Register today. Are you working on a wool project? Join Jill for an all day wool workshop at the shop where you can work on any wool project. 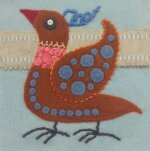 Jill will be there for guidance and encouragement as you applique, embellish, stitch on any of your wool projects. A whole day for you and your wool projects on Saturday, Sept. 13, from 10 a.m. - 4:30 p.m. Register today. We're Going Back To Greenbriar!